Vegetable prices are soaring ahead of the Lunar New Year holidays due to the coldest weather in recent years and heavy snow on Jeju Island, the main vegetable production area in winter. According to the Korea Agro-Fisheries and Food Trade Corporation on Sunday, wholesale prices of radishes reached two-thousand-511 won on average as of Friday, up 49 percent from a month earlier. Average wholesale prices of Chinese cabbage and scallions also jumped 45 percent and 34 percent, respectively. 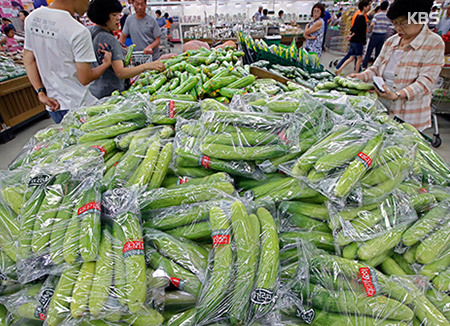 Prices of zucchinis and cucumbers spiked 64 percent and 53 percent, each. Wholesale prices of apples, a popular gift item for the holidays, increased four-point-three percent from a month earlier, while those of pears dropped two-point-four percent.